This is an unedited version of an article by Aamer which appeared in the Sunday Mail on the 17th March 2019. On Friday the holiest day of the week for the Muslim community, there was abject horror as they rose on the 15th March, to find that 49 Muslims had been murdered by a white supremacist, as they took part in prayers at two mosques in Christchurch, New Zealand. Many of us received videos not knowing what they were, only to see the massacre of innocents and hear the screams of men, women and children meeting their death. That same day, mosques throughout Scotland were packed to the limit as prayers were held in defiance and solidarity, whilst many quietly wondered when the same atrocity would come to pass here. Like many Muslims I was not surprised by this attack, the writing was on the wall and whilst there has been barely any wall to wall coverage, Muslims worshippers have already been killed or seriously by members of the far-right in England. For over a decade many of Europe’s political leaders have suggested that Islam is ‘incompatible with European values’, engaging with ideas once relegated to the margins of fascism, whilst passing laws which deliberately targeted the Muslim community, it has become the norm to describe us as ‘invaders’. As a community, we are under constant suspicion, in the wake of Charlie Hebdo we had to either be with free speech or against it. Either ‘Je Suis Charlie’ or a freedom-hating fanatic. That succeeded in doing was exactly what the terrorists wanted; they divided and demonised into us and them. In France, they claimed they wish to liberate Muslim women from the veil because it oppressed women. That liberation is of course enforced by means of policemen ripping the veil from women, by fines and ritual public humiliation. The irony on those being liberated is not lost, as the most prevalent pressure on Muslim women in the Western world, today is not to wear Islamic Dress. The Paris attacks fuelled the far-right, but throughout Europe, the rise and normalisation of Islamaphobic abuse has created a sewer from which the likes of Anders Breivik and the latest white supremacist have risen. Some of those now crying crocodile tears for the 49 dead were only a week ago baying for the blood of Shameema Begum, jihadi bride groomed and raped at 15, who lost her third baby to the delight of a baying mob. Boris Johnston, Melanie Phillips, Katie Hopkins, Nigel Farage, Tommy Robinson and of course many sections of the media have lit the fire, for which our children will pay the price if we do not stop it now. Election campaigns have been fought with the lives of Muslims and asylum seekers who are portrayed as threatening a “civilised” way of life, ‘invaders’ treated as the enemy within, in language identical to that used by the Christchurch terrorist. Meanwhile, thousands of refugees feeling from war & Islamic State are trapped as politicians play with their lives, knee deep in the blood of thousands drowned by Europe’s border controls. The double standards, the hypocrisy stood exposed on Friday as right-wing sections of the media, used to attacking evil-minded animals when they happen to be Muslim terrorists, swung into action to humanise the Nazi white supremacist with a picture of a pretty blonde boy, who had lost his father to cancer and bullied at school for being chubby. Other sections of the media raced to broadcast segments of the killer’s video as he carried out the massacre or allowed their readers to download his death manifesto. My community wondered when if the stories of the unsung 49 victims would ever be given more prominence than that of the ‘angelic blonde boy’ who turned into a white supremacist terrorist? Will we hear of 71 year old Daoud Nabi, a grandfather, an Afghan refugee who emigrated to New Zealand from Afghanistan when the Soviets invaded in the 80’s, he had founded the mosque, had 9 grandchildren and threw himself in front of a worshipper as the bullets came. 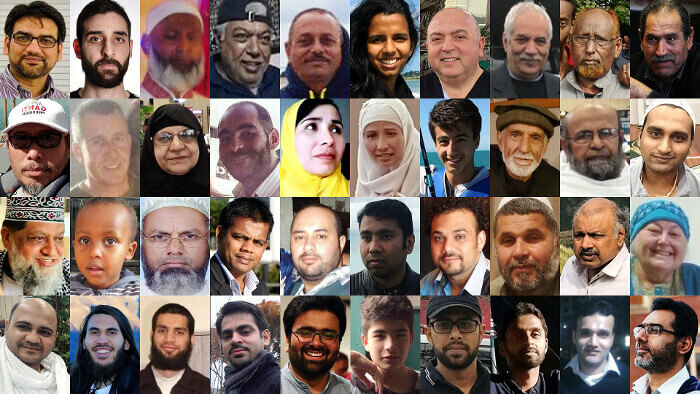 Will we hear the stories of the immigrants murdered who had come from Palestine, Tunisia, Bangladesh, Morroco, Yemen, Iraq, Jordan, Syria, Iran, Afghanistan and Pakistan all of whom had made a quiet life for themselves in Christchurch. We know the drill, when a ‘Muslim’ terror attack takes place, we always pray it wasn’t a Muslim, it is always described a terror attack, mental health is no excuse, there is by the minute reporting, when we go to work everyone wants to ask our opinion, we have to justify our values, our religion, and our very existence. Then there is a rush to blame Islam, the demand on our so-called ‘community leaders’ to do more to condemn, to flush out those responsible for radicalising and recruiting. But I have always wondered do you really think that in between bringing up our children, going to work, keeping a roof over our heads that we just happened to be hanging out with the local Jihadi John? Yet when this white supremacist carried out his atrocities, those of us who called out the hypocrisy and the whipping of Islamophobia were accused of being opportunistic and politicising the deaths! But the real hypocrites were desperate to tell us of their sorrow, whilst others said this was not a terrorist attack but the actions of a ‘lone wolf’. He went to conclude that the victims were not blameless, by that logic I suppose Senator Anning would describe as blameless the terrified child, chased down the street before being repeatedly shot and killed, or the wife killed whilst trying to protect her husband who was wheelchair bound- and so on and so on. As for the killer’s Death Manifesto it stated admiration for the darling of the far-right- Donald Trump as a ‘symbol of renewed white identity and the common purpose’. Trump’s first act following the attack was to tweet Breitbart, the website that has acted as a vehicle for Alt-right, the far right and white supremacists. Trump could not even bring himself to use the word Muslim when he finally got around to a token condemnation. How could he; he wanted to bring into law the travel ban on Muslims. He will never face up to the fact that more Muslims were killed on Friday by a Trump supporter than Americans have been killed by refugees from banned countries in 30 years. Trump refuses to condemn white supremacism as a problem, after all, he described himself as a ‘white nationalist’, but it is white supremacy that is murdering those worshipping in synagogues, mosques and black churches. It is the far-right in this country that is growing in his country at an astronomical pace. As the funerals begin to take place in the days and weeks ahead, I hope that there will be a period of self-reflection by our politicians and media. It’s all very well to blame social-media platforms, but our politicians and a horde of media executives have failed to lead by example instead engaged in and feeding the hatred. As Muslims, for years we have learned to be the ‘other’ in our communities, we are marked out because by our skin colour, our beards, headscarves and our religion, but we also travel on the same buses and planes, eat in the same restaurants, use the same shopping malls, live in the same streets. Which means we are just as likely to be blown up or killed by bullets because our religion gives us no immunity from terror. My parents shed blood sweat and tears to help build this country, prior to 9/11 they were regarded as good hardworking and peaceful immigrants, they never really changed, but society has. But like those who died in Christchurch, my parents have earned the right to live our lives in peace. The real test will be to see how society reacts to attack, the normalization of Islamophobia, the drip feeding of poison, the incubation of hate on social media, will we continue to ignore it or will we call it out? This time round responsibility rests with the rest of society and not just the Muslims community. The antidote to hate and division will always be compassion, humanity and justice.